You set that dumb figure. Historians actually, but eh... what do I know. And around half of the 100mil+ were due to famines. essentially gave the government free hand to expropriate businesses and private property at will. One time Hugo Chavez even went on his weekly TV show from Caracas and started pointing at buildings in the vicinity giving orders to expropriate this one and that one, essentially seizing private property at will. This greatly contributed to the destruction of many industries across the country. The maduro government is just a continuation of that nonsense. At this point people essentially show up to government events in return of a bag of food. Failed system in failed country. Pressure needs to continue until the military turns against Maduro and the government changes. Plain and simple. To AK16, yes I'd much rather see intervention than watch my people slowly starve. 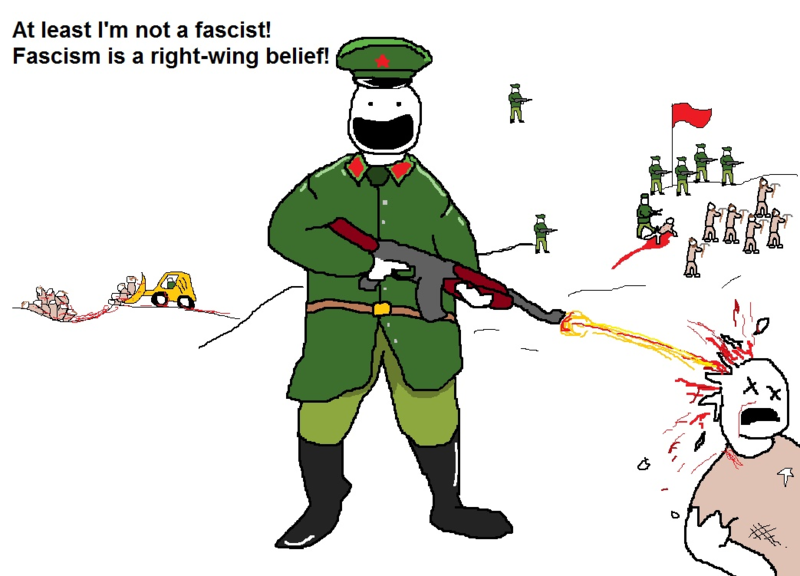 All communist states have held authority with the direct threat of physical violence. No surprise the Armed forces hold so much power. I don't need to post the relevant chairman Mao quote. I think that it is incorrect to judge socialism through a perfect application of its rules. This allows one to dismiss the numerous attempts to build a socialist/communist society. at the same time, capitalists could claim the same thing saying that it has never really been tried in a pure way. Or the Myanmar military junta. But in the end, the balance still tends to go a certain way. And then you have 'the massacre on Tianamen Square' where it curiously turns out that 0 people died. BBC later retracted their story (nobody knows that of course). 'Capitalist' wars have killed millions too, Vietnam etc. Who knows today that the right wing coup in Indonesia 1965 (very much West engineered) killed ca. 1 million people, most of it in outright slaughter? About Venezuela it seems the coup there has flopped, that is the situation right now. War coming up? I'm not sure. I haven't heard any news of major protests since about two weeks ago. Every day there are new news stories with some journalist saying that Maduro's time is almost up, but I don't see how unless someone gets around to forcing him to leave. Locals are so fed up with the current situation that a lot of people welcome armed intervention. Life is pretty rough down there. Source: My family in country and social media channels where locals express themselves. Thanks for posting information from family. MOSCOW/LONDON (Reuters) - Venezuela’s Nicolas Maduro has sought OPEC support against U.S. sanctions imposed on his country’s oil industry, citing their impact on oil prices and potential risks for other members of the producer group. Not even OPEC wants to deal with this. Struggling Venezuela already is producing oil at a multi-decade low, but the socialist nation's crude output could fall another 50 percent by 2020, further imperiling the economic plight of its industry and citizenry, according to a new report. Washington has put the brakes on the secondary market for PDVSA bonds. The Treasury Department issued an amendment to trade rules under the Venezuelan sanctions regime on Monday, listing all of the bonds and debt instruments majority owned by Venezuela’s government or its quasi-sovereign oil firm PDVSA that are now essentially stuck in limbo. Any investor holding PDVSA or Venezuelan sovereign debt either has to sell it to a foreigner or hold on to it and hope for a better day. The amendment makes it more of a legal challenge for the U.S. subsidiaries of PDVSA, including Citgo, to transfer funds out of the country. Last week, Reuters reported that Venezuela had opened an account with Russia’s Gazprombank in order to facilitate payments from blocked accounts. Gazprombank denied the report. U.S. firms and individuals are allowed to engage in transactions that are ordinarily considered incidental and necessary in dealing with PDVSA and its subsidiaries here. They can also provide brokerage services or sell any debt by PDVSA issued before August 25, 2017 so long as the sale is to a non-U.S. person, absent authorization from the Office of Foreign Assets Control at Treasury. Food market.. does not look so bad. Haven't seen many if any skinny people in any of the videos or photos. Believe it or not there actually is a bit of food left in the country. All times are GMT-8. This page was generated at 04:44 PM.